Bali Traditional Tour They performance kecak dance every Monday. The kecak dance is common Balinese dance for a couple of reason. First there is no musical accompaniment. The Gamelan is not there. Rhythm is provided by a chanting 'monkry' chorus. The polyrhythmic sound of the chanting provides the name 'Ke-Chak'. They also act as various monkey armies in the story. 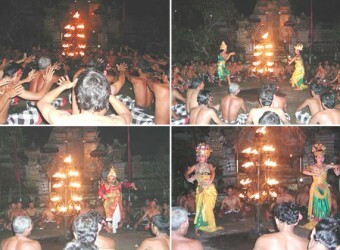 I had ever seen Kecak dance only in Uluwatu Temple, and this time she wished to watch it in Ubud. It was played by a large number of dancers, and the dance has a high quality. The dance started after the sun went down, under the night sky…The place of the show has nice atmosphere, it was livelly after the dance began.